Preheat your oven to 200C.. Poach the pear in boiling water for about 30 minutes then cut it into chunks.. Cut the cheese in two pieces and drizzle a little honey and crushed pecans on them.. Place them in an oven safe dish and bake for about 7-8 minutes.. In the meantime make your dressing.. 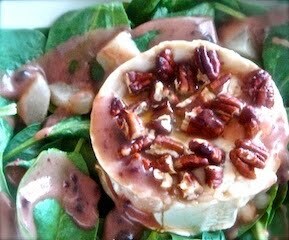 Combine the vinegar, mustard and oil.. Add the marmalade, blend everything together and season to taste.. Toss it with your spinach, remove the goat cheese from the oven, add the chunks of pears and place it on the salad.. Drizzle with a little more dressing, et bon appétit!